Every Saturday night is homemade pizza at my house. It's a standing movie date at home for my hubby and me. Any child (they are teenagers and older) that happens to be home is welcome to join us. Some nights we have a quiet night to ourselves, and other nights, we have a house full. It's become a fun tradtion for us. Let me give you a disclaimer. I can not make bread. Seriously, that and Jello. (I know Jello?) but, with my handy dandy bread maker I've gotten pretty good at Pizza dough. I know your thinking, wait, Tip Garden is supposed to be about quick and easy ideas. 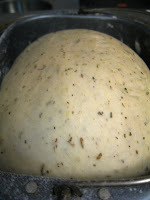 Home made pizza dough is not quick nor for some of us, easy. But using the bread machine for most of work is easy and it is a super money saver for sure! 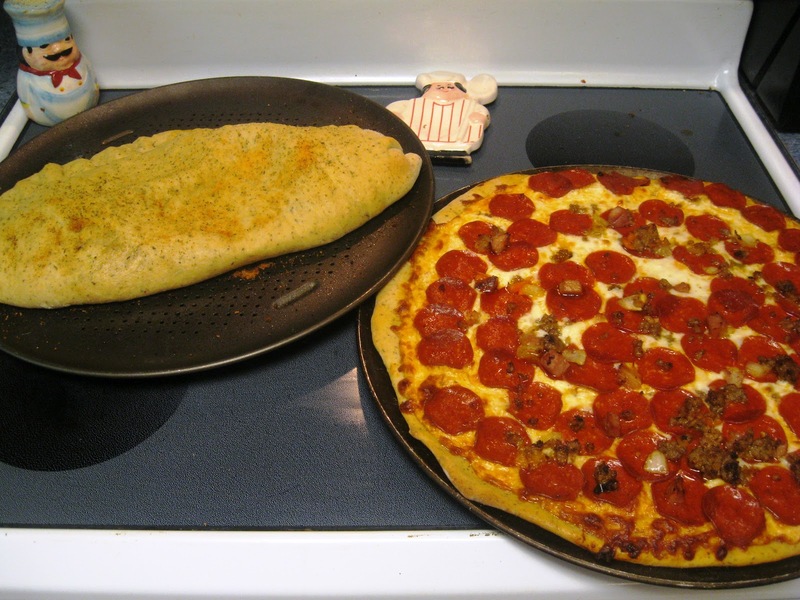 Over the years I've developed my own recipe for a Garlic Bread pizza dough that my family says puts any pizza, calzone or stromboli over the top. Finally, I thought I'd share it with you. It makes enough for two pizza's. Hubby & I like thin crust and this recipe can be rolled out to make 2 stinkin' large (16 inch) pizza's, so if you make smaller ones you'll get a thicker crust. This recipe is for a machine with a 2 lb. loaf capacity. 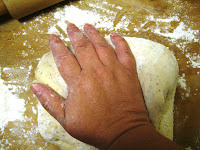 and knead a few times to deflate the dough and make it workable. 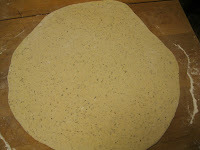 Roll out pizza dough, using rolling pin and extra flour as needed to keep it from sticking as you work with it. Don't be afraid to pick it up, flip it over, sprinkle more flour front and back and keep rolling. I tend to turn it a 1/4 turn constantly as I'm rolling it. 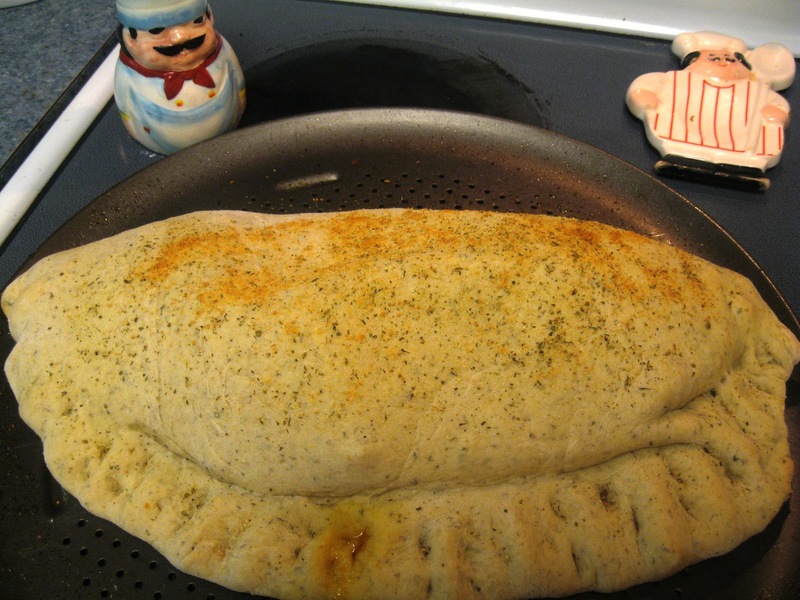 From here you can make it into pizza, stromboli's (or calzone's). 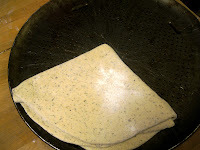 Fold dough in half to make a half circle and then in half again to make a small triangle. 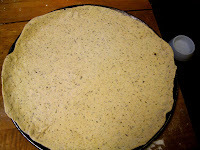 Pick up dough and transfer it to the pan, placing the point of the triangle in the middle of the pan, then simple unfold the dough. Ok, I think you can take the pizza from here! I bake mine at about 400 degree's for about 15 -17 minutes. 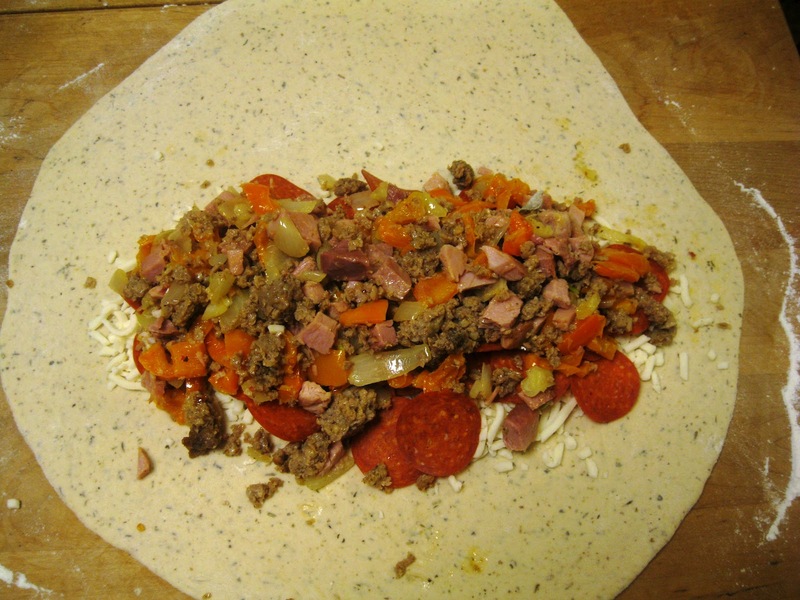 To make a stromboli or calzone, fill the bottom half of the rolled out dough with filling (sausage, cheese, etc.) leaving an inch of dough along the edges. Sprinkle water along the bottom edge of dough (to help the folded over edge seal together with the bottom edge and fold the top half of dough over the filling. Pinch the two seams together to seal the stromboli. Bake at 400 degree's for 15-20 minutes till dough is golden brown. Oh - this looks delicious. I'll have to give it a try soon. Becky, thanks for stopping by! I do hope you like it! That sounds like a great recipe! Since we love homemade pizza's, stromboli's, calzone's I'm always on the lookout for a different way of serving them. Thank you for sharing! Thank you for taking the time to send me some feedback! If you do try it, let me know what you think! Looks so delicious...and great tutorial. Thanks for the kind words! You made my day! Sorry to hear about your bread maker! Hope you get one sooner rather than later! Sounds good! 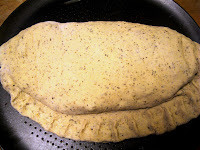 Like the idea of adding seasoning and parmesean cheese to the crust itself. thanks for sharing on Busy Monday! In your recipe it calls for a '1/4 Grated Parmesan Cheese' is that a 1/4 cup? Just need some clarification. Exactly the question I needed an answer to. Got it fixed finally! thought I already did! Thanks guys for being so on top of things! I have a recipe for plain pizza dough that I used, but I'd love to try this flavored dough! There are only 2 of us though, so if I make 1/2 the recipe (for 1 pizza) will the dough setting on the machine still be the appropriate amount of time, or will that not work? Or, could I make the whole batch and freeze 1/2 of the dough? Barb, you can use the same dough setting for half the recipe, or you can freeze half. 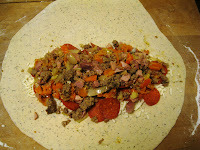 Or feel free to use the seasonings in this recipe in you usual pizza dough. Let me know hoe it goes. I tried it out tonight. I made half the recipe and baked the toppings and dough together. Turned out great! Thanks! Oh yea! I am glad to hear it turned out great for you! Thanks for coming back and letting me know! Love it! One more question! My other recipe has you bake the dough on its own a bit first, then take it out and add the toppings and bake some more. Do you just bake this all at once (raw dough with all the toppings)? Thanks again, I can't wait to try this! 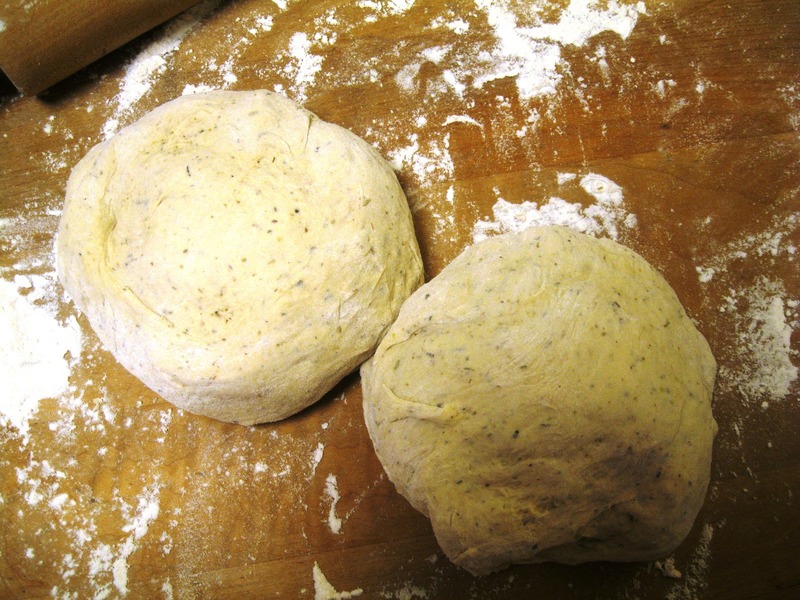 We prefer to pre bake ours for a crispier crust, but you can top the unbaked dough, for a softer bread crust. Best of luck! Don't you need sugar for yeast recipes? I'm trying it now as is, I'll let you know how it goes. Looks great! Going to try today! 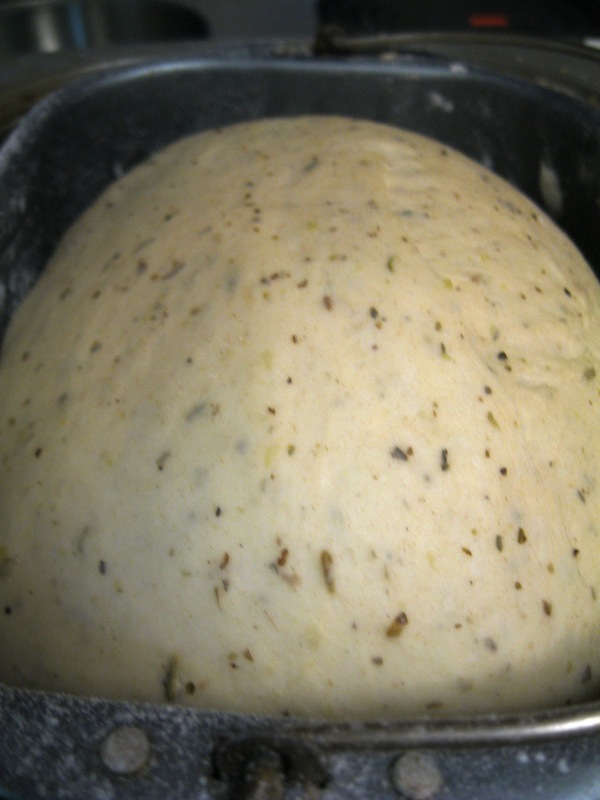 How long and at what temperature do you usually pre-bake your crust? Cara, I usually bake mine at about 425° for about 7-8 minutes, till the dough is cooked through, but has not started to brown or get crispy yet. Thank you so much, Jan! We made it last night for pizza and it was AMAZING! My new go - to pizza dough from now on! oh,yay! So glad to hear you all loved it! Happy Pizza nights to you! I'm wondering if you can freeze this dough?? Our household loves this dough. We've made it about 6 times this year! Thanks for sharing it! Forgive me for the delay in responding! I've actually been without internet due to a mix up in switching providers, and am just now getting back "on line". I am SOOO happy to hear that you all enjoy it! Thanks for the feedback, made my day! Hi, my dough didn't rise. I tried it again and I added 2 tbp sugar. then it worked great. what type of yeast did you use? It sounds like you used regular yeast which does require sugar to activate. This recipe uses fast rise yeast which does not require any sugar or water and can be mixed right into the dough. I used bread machine yeast. I ended up making 2 batches one I froze and later turned into buns. My family loved both the p pizzas and the buns. I have no idea how I didnt' see your message till now, but I hope it went well! Thanks for stopping by! I have no idea how I didnt' see your wonderful message, but I hope it turned out delicious! Love love this recipe, ever since I came across this, my husband and I haven't ordered pizza or bought frozen pizza!! They just don't compare! Mindy, you wrote this a year ago, and I am just now seeing it! yikes! I am so glad you love it! We do to, I make it every week! Thanks for your kind words! Making it now! Can't wait to try it!Love my bread machine for pizza dough ! I also make yummy pecan rolls with mine! Pecan rolls.. yum! now that sounds devine! Yummiest pizza dough recipe I've tried. I wanted something other than just plain pizza dough and this is it! And it's just as easy. I've made it a couple of times and always comes out perfect, thanks so much!! I'm embarrassing late in replying back to you, but I am so thankful you like it! I literally make this all the time too! Thanks Sarah for coming back to comment, you made my day today when I stumbled onto it! This is truly fantastic and easy! My husband (who loves his pizza delivered from the pizzaria) and our three children LOVE it! THANK YOU! So glad you like it! I truly do make this dough every week myself! I have made this several times and it is wonderful. I do have a quick question. We have an extra person living with us for now so I need to make 2 batches. I see where people say they freeze one so my question is what's the best way to freeze it and when I go to use it should I defrost in the fridge? Thank you for such a great recipe! This looks delicious, but I have a question. Do you have to cook this in the oven? I have one of those Pizza Pizzazz machines, would this work on that? Thanks. I found this on Pinterest. Very easy and tasty recipe. I found the doe to be firmer than other pizza does. Rolls out nicely. I precooked it by adding the sauce and some parm cheese for 5 mins at 450 convection oven. Added rest of toppings and baked for additional 10 mins. Everyone liked it.